Properly watering your grass is essential to growing a beautiful, lush lawn. Watering keeps your grass healthy and attractive, even when rainfall is scarce. After all, most of what makes up a blade of grass is, in fact, water. It’s important to water your lawn at the right frequency, duration, and volume so that your grass gets the most benefit without unnecessary waste. This article discusses some important strategies for water supply and distribution, soil considerations, how much to water to use, and when to water your lawn. This article would be incomplete if it didn’t include information about plant selection and grading as these can have a huge impact on how much water your lawn requires. Proper site development and vegetation enable you to develop an effective watering strategy, eliminating waste from runoff and poor grass selection. Many of you won’t consider these suggestions as you already have an established lawn, but if the fundamentals of your lawn aren’t right, proper watering technique will have minimal effect. I’d encourage you to seize every opportunity to improve grass type and grading. Major underground work like implementing an irrigation system or restarting your lawn are opportune times to make some changes. Grass Type– It’s important to select the best grass type for your location. Don’t plant a grass that will require daily watering in the desert! For arid conditions, choose a drought resistant grass like Bermuda Grass or Kentucky Blue Grass. Alternately, Perennial Ryegrass and St. Augustine varieties thrive in moist environments. If you need help identifying your grass type, the University of California has an interactive guide here. Landscape Grading– Well designed landscapes will all but eliminate the need for additional irrigation. Optimal grading will collect direct and indirect rainfall, delivering water to nearby planting areas. The goal is for water to penetrate and move through the top layer of soil, directing excess to drain from your yard. Remember, water above ground and below, flows downhill. Ensure the ground slopes away from your house and plan how water will move through the soil. As a rule of thumb, your lawn should drop 1′ for every 50′ of distance. Ground Cover– When planning your lawn, it’s important to consider locations where ground cover is a better alternative than grass. These are often hillsides and shaded areas where no amount of watering will help. Steep slopes lead to run-off, creating drought conditions that hinder grass growth. Ground cover, like Creeping Phlox, can tolerate the drought and help prevent soil erosion. Densely shaded areas make it tough for grass to thrive. You should choose ground cover like Houttuynia Chameleon or Periwinkle that love the shade. Soil texture refers to the amount of soil separates, sand, silt, and clay, present in the soil. The proportions result in different moisture-holding capabilities and how much water is made available to plants. For instance, clay soil has plenty of moisture-holding space but the pores are so small that plants cannot access it. Meanwhile, sand provides ready access to roots, but water evaporates out of it very rapidly. The best balance is achieved with a combination of all three, referred to as loam. Silt loam and sandy clay loam are able to hold a good amount of water and provide a significant amount to vegetation. Organic matter also plays a part in how much water a soil can hold. Increased organic matter results in more plant-available water. Many higher education institutions provide soil testing as part of their agricultural program. Check with the colleges local to your area, and have your soil composition analyzed so that you can plant accordingly. Soil texture is considered a stable property even though you can make changes. Modifications involve considerable machinery and are prohibitively expensive. Even so, You can add soil separates and organic matter to the top 20-30cm of soil. Lawns should be watered as infrequently as possible to promote deep roots, which result in greater defense against weeds and drought. You may think late spring or early summer sets an absolute start date for watering. That’s not the case. Instead, you should water your grass during it’s active growing cycle. To learn more about active growing cycles, check out page 3 of this publication by Iowa State University. 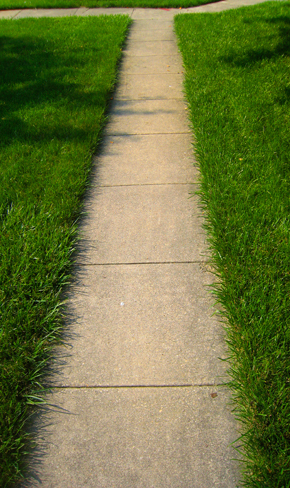 Watch for footprints or bent grass blades as you walk across your grass. Healthy grass blades will bounce back. Stressed grasses will become a darker bluish-gray color and you can test root zone soil for additional confirmation. Water your grass early in the day, while temperatures are cooler and there is less wind. Midday watering results in significant evaporation and only a small portion actually gets to the roots. Watering your lawn at night promotes fungal diseases as the grass remains wet all night. The University of Florida cites overwatering as homeowners’ most common mistake. Overwatering can damage or even kill a lawn and actually decreases drought tolerance. Excess irrigation can lead to fungal diseases like Summer Patch that need excess moisture to take hold. It attracts soil insects and pests like Pill Bugs and increases the risk of runoff, often putting chemical into the water system and not your lawn. To top it off, homeowners find themselves paying more in extra mowing and water bills. Grasses like fescue will go dormant during drought or intense heat. They turn brown but are not dead. Let dormant grass run its course rather than applying water to green it up, only for it to go dormant again. There are special considerations for watering after applying lime, fertilizer and weed control. You should avoid watering after applying a broadleaf weed control or fertilizer as it will wash away making it effective. Alternately, you should water your lawn to encourage a pre-emergent weed control like Crabgrass preventer to penetrate and form a protective barrier. Follow manufacturers guidelines for best results. Thoroughly water the grass so that moisture soaks down deeply encouraging roots to grow further into the soil. Shallow watering results in shallow root structure and promotes weed growth. Make sure the water is evenly distributed, and avoid flooding and excess runoff. Most lawns require an inch of water per week during the growing season, including rainfall. 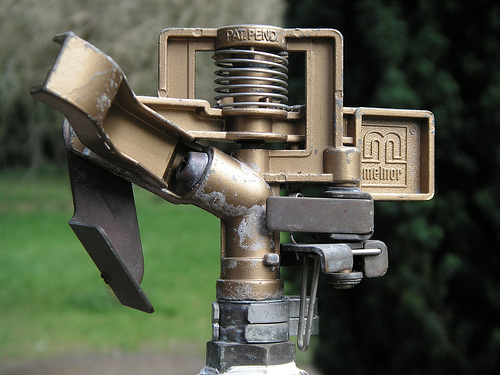 Aerial sprinklers are the most common water distribution method for home owners. Take care to ensure uniform coverage, and avoid flooding and runoff. This may necessitate several applications. Wind can make aerial sprinklers less effective so choose one that keeps water close to the ground and avoid fine mists that will be swept away on the breeze. This style results in a rectangular patter but most of the water lands near the sprinkler head. For that reason, it’s tough to maintain a uniform soaking. Soaker hoses are flat hoses with several small holes resulting in fine streams of water. These are best implemented to water irregularly shaped areas. These are not a good choice for an entire lawn as water is delivered slowly and they would need to be moved repeatedly. Most rotary head sprinklers have an adjustable screw or paddle that breaks up the stream to better disperse the water. These are great for large areas and can be set to avoid sidewalks and houses. Rotary sprinklers are most effective when placed in an overlapping triangular pattern. Whirling Head sprinklers don’t have much reach and most of the water is deposited nearby. This makes them great for watering tight locations but requires frequent relocation. What do you think? Are you watering your lawn too much? Thanks for the info on night watering, Ethan. Didn’t realize the issue with fungal growth, I always assumed it was a great time to water (as I water at night) because I don’t have to worry about evaporation. That, and it’s ridiculously humid down here during daytime hours. Wow, that’s a lot of info. Hubby’s trying to figure out how much/long to set our sprinklers to so I will definitely have him read this. We knew about morning watering, so we are at least doing that right! Wish I’d seen this before trying some lawn renovation that turned out badly. The points about the different attributes a sprinklers would also have saved me quite a bit watering.